You’ve probably heard a lot about the importance of building a writers “platform”. Most experts in the publishing industry recommend you do this even before you land an agent, especially if you decide to go the Indie publishing or self-publish route. The thing is, a lot of people confuse a writer’s platform with a digital footprint, and although there is some overlap in the two initiatives, they are two totally separate subjects. Today I’m going to briefly discuss your digital footprint. The fact is there are entire books devoted to this topic and there is no way I can adequately do it justice in 500 words or less (Challenge guidelines – keep posts as short as possible), so if you’re really interested I suggest you Google “Digital Footprint Books” and a whole list will be there for you to choose from. To use a simple analogy of a hog calling contest…a digital footprint is all about how loud you yell…not what you yell. In this day and age it’s virtually impossible to NOT have some sort of digital footprint, so even the most careful of us are whispering something. If you matured in the on-line world like I did, you were wary of how much personal information you revealed and where you allowed it to be stored. But as aspiring writers we can no longer think that way. Blogs, Facebook, Twitter, Google+, Pinterest, YouTube, LinkedIn, Tumblr, Forums, and a list of others that go on and on represent just how much volume is available for us to employ in building our footprint as wide as we can. Why, you ask. Or maybe a better question is…do I really have to do all that? The short answer, No. But let me ask you this, if you were in the querying stage do you think you’d get better results if you sent out 100 letters, or 10? You send out 100 to improve your odds of finding the agent who’s right for your book. Creating a broad digital footprint increases your odds as well, but in a different way. The chance of reeling in an agent could hinge on the size of your footprint because in some cases it’s a factor they use before deciding whether they want to take you on or not. But cheer up, all of your effort pays extra dividends when you finally do reach that published plateau because now that established footprint becomes a useful marketing tool. So the choice is up to you. How big of a footprint are you trying to maintain? Here’s an interesting tidbit for you…the name of my blog, CRUISING ALTITUDE, was actually the name of the blog my main character wrote in my first book. I decided to adopt it when I created my own blog. I added the 2.0 after I took a significant break in 2011. Footprints are very important, if you follow someone's footprints you may get a surprise as to where they may lead. you. I realise I sign up for things and never use them - is that any good? In fact I have a feeing I just signed up for LibraryThing for the second time... now they have 2 users, me and me! Well first off digital footprint sounds pretty cool. "Hey, I have a digital footprint." It sounds much cooler than it really is though. My foot print isn't so big. I mostly on blog. And for right now I'm ok with that. I don't do too many of the things you list - blogging's my biggest thing, but I'd like to think an agent would like what I've got going on. It's not just about the writing any more, they want someone who can market themselves... the internet has definitely changed the publishing landscape. For good or worse, I'm not sure. I'm out there but not too out there. I'm too easily distracted by shiny things and I don't get any work done. Oh, all the things you listed make me tired, very, very, tired. But I'm trying! I started my blog with the intent of attracting an agent for my many unpublished novels. I do not have an agent, but I enjoy blogging and have worked up a strong readership too. These days there are so many choices to make on how you communicate digitally. It can be overwhelming with so many people telling what you should do, what not to do. Personally, I think less is more! The people who are on everything never seem to be able to devote as much time to anything, so one or two of their social media sites suffer. For me, I like having two or three social media I can really put time and effort in without my writing suffering. This is a fabulous post! I am so glad I spent the 9 months my book was in production creating both a platform and a footprint. It made a big difference when the book came out. It is an ongoing challenge to keep up with it all. I am now trying to learn to balance. My digital footprint is huge. How do I know? I google myself. Every comment, blog, website, book or article written, etc I've ever put on the web is there...currently up to 150 pages worth of just me. Not too shoddy since the internet came into being and searchable. Great post...as usual. I had not heard the term "digital footprint" before. Apparently, mjnd is pretty big. Hopefulky that will pay off at some point. Anymore,though, it seems harder to avoid the digital footprint than to have one. Hi Don - the footprint seems to cover all the marks - the most important - is your footfall back safely on this planet and are you recovering properly ..
Look after yourself and all that footprint stuff is waaaaaayyyy tooo much!! A footprint connected to how loud you yell? In my case that sounds like a dangerous combination. Useful info, DL. I sometimes google my name or terms I associate with my work to see how big of a footprint I have. At a writing conference, I asked several agents whether they click the links to social networks, websites and blogs that us authors put in the bottom of query letter emails. They almost all had the same answer: Yes, IF they're initially grabbed by the query itself. For that reason, I try to keep content on my FB, blog and website fresh. I'm not going to lie though, I hate twitter. Nice. I need to be more conscious of this stuff...but that's why I hired my husband, right? He's supposed to be the tech geek. *sigh* I need to perfect that time-freezing machine NOW, so I have time to get all this stuff grounded in my head. Well, now that I know what a digital footprint is, here's to stomping around with it! I think I'm happy with my footprint right now. I'm not everything I could be, but I know I just couldn't handle keeping up with all the different options available. Blog, fb, twitter, and pinterest. This is good for me. I hadn't heard that much about digital footprints before, so now I'm better informed. Also, enjoyed learning how you named your blog. Very insightful. Thank you for sharing it with us. I'm in favor of having a 'digital footprint' but I think sometimes people take it so far they don't have time left to write anything. For example, I have an FB page but I never go there any more because 1. not a fan of the whole FB thing (tmi sometimes) 2. it's not my bag baby 3. I find blogging much more conducive to connecting to the sort of people I'm interested in - other writers! Sometimes I feel like taking the time to make my digital footprint bigger is taking away from the time I could be spending writing. It's tricky to find a good balance! There's so many places to leave a footprint these days. Some of them I'm just there, but I'm there. Are you on Wattpad yet? I hadn't thought about it in terms of a digital footprint but I guess you're right! I only use my blog at the moment I'm not sure I could cope with all the other outlets, maybe one day I'll sign up for Twitter. great post and i think i am worried of where i have been will reflect where i am going. Digital footprint makes sense! I guess that's what sites like Klout measure. Great post! Have fun with A to Z. You've done it again...put your 'Foot Down' and given your readers some great info on stepping out into the world of 'Platform Awareness'. If I wore platforms, I'd break my neck right off the bat. So, I've been taking baby steps wearing my sneakers and trying not to look like I'm wearing 'FlipFlops'. Can't I just buy some of those Bigfoot feet? I'm mostly a blogger (small time) but i am writing a book too...thanks for sharing. I've actually never worried about my footprint. I've never been fortunate enough to have a stalker. 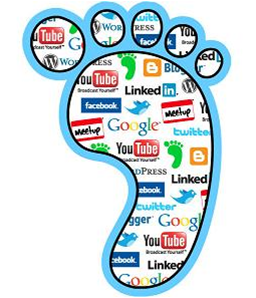 My digital footprint is one toe, which I will call the Blog Toe. I've tried to get interested in the other toes, but they really don't appeal to me. Maybe someday I will have an entire foot. Thanks for the info! I didn't even have an online presence until I signed my first book deal. I may not be on a bunch of social sites, but I've done my best. Some bloggers in this Challenge are amazing when it comes to a loud and effective online presence. I'm always impressed when I visit their sites. I'm scrambling to catch up on this AtoZ and praying that my footprint is solid. Enshala. It has been on my mind to build my digital footprint, so thank you for giving me some food for thought! I have been working on writing a book & any info from experienced authors is very appreciated. This was a great explanation. I liked the yelling versus whispering analogy you used. No doubt leaving your footprint is important, but except from blogging, the other media bores me too much. I used to be nervous about how much information I shared online. Now I'm careful about personal stuff, but I spread word about myself as far as I can (although I have not yet succumbed to the lures of Twitter and Google + ... I already spend way too much time online as it is). I have a Pinterest account, a Facebook page for my blog alongside my personal one, and I think this Challenge is increasing my footprint considerably! You bring up a lot of good points with your Footprint analogy. I totally respect where you are coming from and much valuable advice you offer. In my case, my writing is a positive resource. A cathartic, therapeutic endeavour where if my sharing is something that evokes emotive responses, that's all that matters to me. I am but somebody who is here in the background who discreetly supports and encourages. That's all I really need. Be well and enjoy your weekend. Cool graphic. I have learned so much to inform my writing in cyber land. I'm trying to add a new wing every year. I'm still trying to figure out Google Plus. As an indie self-pubbed author, how else will anyone even know my books exist if I don't build an online presence? Marketing has always been part of a writer's life - now it's just digital. However, I would like to mention that Real World interactions are still an important part of an author's footprint/platform. A good mix of online and Real World events = wider outreach to readers. Having a digital footprint is key as a writer. i need to jazz up my footprint, i guess! enjoyed your excerpt! and looking forward to another deja vu! dec is a long ways off! wow, my book will have been out for 5 months by then! I'm enjoying all these tidbits about you, Don! As for my digital footprint, I'm sure it's rather tiny. I have a blog, of course, and I'm on FB, Twitter and LinkedIn, but I don't spend a great deal of time on any of them. And I don't post as often as I used to on my blog. Since I didn't grow up with this barrage of social media as you did, I'm less attracted to it all. And I hate that it's all about how loud you yell. I try to work on making a big footprint, but I've only so much time to spend online a day. It makes it difficult. I've heard of carbon footprint, which we are encouraged to REDUCE. Now there's a digital footprint, which should be INCREASED. I think mine are probably the opposite. Good information! It's hard to find the time to really get out there, online or otherwise. I can only yell so loudly! This is a great post, and I'm talking about something similar on Monday. At least I think it's something similar. I think I've been increasing my footprint. Maybe I haven't been. Hmmm. Great post, and a really great analogy. I love analogies...I guess I need a bigger footprint, but I don't want to do more than I can keep up with and just recently actually filled in my profile for google+. I'm still not sure about LinkedIn since I don' work outside the home and my one published story didn't make me money, it was for a fundraiser. Do you recommend LinkedIn for writers like me? Excellent post. Very important distinction between the digital footprint and the platform. We can (and should) all create a digital footprint. I think it's sometimes difficult for fiction writers to create a platform, at least those of us who have neither series character or series theme. I hope that I'm leaving a clear digital footprint and one that people will want to follow. I use twitter the most, and tend to link everything there. When I post in comment forums, I have my sign in either point back to twitter or my blog, and each of those point back to the other. I think it makes it easier to have a dominant social media presence in primarily one or two places and not everything under the sun. It's too hard to keep up with everything. Great post and good food for thought! Digital footprint is so key in the age we live in. "The chance of reeling in an agent could hinge on the size of your footprint because in some cases it’s a factor they use before deciding whether they want to take you on or not." - Didn't even think about that! Great Post! Man, I'm learning a TON already from more experienced writers and we're not even halfway through the alphabet!! Much thanks for your post! It's true the social media is a big part now of publishing and marketing. I am hopeful that by doing and finishing the A to Z Challenge I'll be able to keep up a better digital footprint through blogging. What ain interesting way to come up with your blog name. Great post! I don't want to yell...just be there! The writing world has changed dramatically with technology, hasn't it? We used to be at the mercy of the Big Publishers, but now there's so much more freedom and power out there that we can do so much on our own. But that doesn't mean we *can* do it on our own. We need that platform, that group, those followers, those friends, those likes, those like-minded, those readers, those fans and especially we need to be active ourselves. We can't just sit back and think it's all going to happen. It's going to take some work. Those who aren't willing to do the work will have less of a chance. But for those who are, see you at the finish line. This will always be hard for me, because I hate being the center of attention. And this for me too! But it's easier to be the centre of attention online than in da flesh!! Thinks for the info. I've heard of leaving our digital footprint everywhere we go but I had no idea what it meant in relation to our platform . There are so many social medial options available and sometimes I get overwhelmed . Interesting tidbit about your blog name, I did not know that. I haven't been blogging for very long, so my online footprint isn't that distinctive. Regardless of what industry professionals think about my blog, I find it rewarding to put myself out there and make connections with other writers. I never heard of the term "digital footprint" but I agree with you that your media presence should have some purpose that points to a goal that's bigger than just being seen/heard. I'll research this new term. Great post. Right now I frequent facebook, twitter, and pinterest, but increasingly see the need to utilise my Tumblr and Google+ accounts more often as well as create an account on LinkedIn. I am still sitting on the fence as to how "into" blogging I want to get at this point with my Master's beginning in September. I think it'll be slow, tiny steps for this gal's digital footprint.